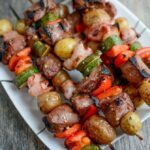 These Grilled Steak and Potato Kabobs are perfect for a healthy weeknight dinner or your next summer BBQ. A simple marinade adds flavor to the steak and veggies and the potatoes are pre-cooked in the microwave to make grilling quick and easy! Cut the pepper and zucchini into chunks as well. Combine steak and vegetables in a large resealable bag. In a small bowl, combine oil, vinegar, soy sauce, honey, Worcestershire, garlic and onion and stir to combine. Pour marinade into bag, shake well and refrigerate overnight. Pierce potatoes with a knife or fork, place in a microwave-safe bowl and toss with a little oil. Microwave 3-4 minutes or until potatoes pierce easily with a knife. Let cool at least 10 minutes. Thread skewers with steak, peppers, zucchini, bacon and potatoes. Grill over medium heat for 8-10 minutes, flipping once.